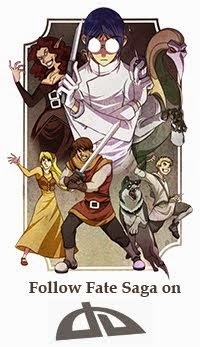 Fate Saga will be presenting at Anime Weekend Atlanta 2011, 12:00pm at room 106. The hour and a half long presentation will cover both the technical aspects of Fate Saga pilot episode, along with the series' development from concept to its pitch to Warner Brothers, to its future. We hope to see you there! If you have any questions or requests for what the presentation can cover, feel free to comment either on here or on the Facebook event and we'll do our best to include it! *You are not required to register for the event in order to come! This is just to help you remember the date, time and location. These were some sketches I did for Larkspur, the main heroine of Fate Saga. Larkspur is a very sweet, albeit nervous girl. Larkspur is severely lacking in self confidence and tends to be a skittish bird who's easy to startle. 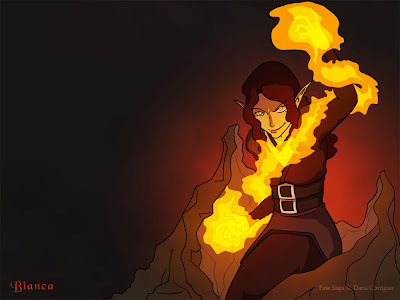 However, despite her worries, she is a cleric who always manages to have it together during emergency situations. She is also a musician, who sings at the Crystalin, a local tavern in Duero that the main heroes frequent. The instrument she is playing in the sketches was originally meant to be a guitar, but at the time I was on an airplane and didn't have access to any references. However, when I showed the sketches to a friend of mine, he noted that it looked more like a mandolin. It was a very interesting note and one I plan to look into. I haven't yet found any suitable instruments she could be 'known' for using, other than her voice, so you may at different times find her with different instruments unless/until I find the perfect one(s) for her. This is a collaborative piece between myself and Samantha de Graffenried, Fate Saga's resident Mittens cat concept artist. I drew Cyrus while she drew the giant lyger. Just about any other character in Fate Saga, even big tough-hearted people like Armand, Cain, Rori and Bianca, would probably flip their lids if a giant beast of a cat had them pinned to the ground. Only Cyrus would enjoy it. Though Cyrus does have empathy on his side. If he sensed murderous intent or hunger from that lyger, he wouldn't be nearly as much of a willing participant. But he has this effect on animals. Too bad he doesn't have it on people. Reference was found on YouTube, posted by careanimalclinic. Here is a great cat walk cycle reference. It features a cat walking from a profile view, replays it and even slows it down to better show when the paws touch down on the floor and when they lift, and the overall posture of the cat. 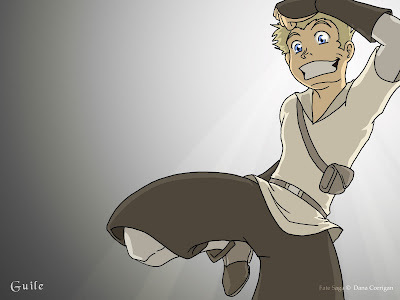 In light of this weekend's San Diego Comic Con, and in anticipation of possibly new viewers who might have come here from the Animation Magazine 2011 Pitch Party, I wanted to extend a hearty welcome and an invitation to kick up your feet, relax and enjoy the story! Twitter and other social media connections are now available to under each post, allowing anyone to share posts if they want to. The option to subscribe to the Fate Saga blog through RSS feeds, in case you'd like to follow the blog without having to come to it continuously. The home page now has 12 posts listed (instead of 10), and whenever you go back to older pages of posts, they will also list 12 posts at a time (instead of 4). This should make it easier to skim through old posts. However, if you run into any issues with the blog running slow or the posts appearing cluttered, please feel free to email me or comment here and I'll make adjustments. Also, if there are any suggestions for what could be added or removed from the blog in terms of widgets or posts, please let me know as well. Fix the Gallery so that all links will lead to the picture's original post instead of just the image itself. This is currently in-progress. Alterations to the blog structure to make it more interactive, less cluttered and easier to navigate. Post frequency is currently every two days. This may eventually increase to every weekday or even once a day, as production picks up. If you have any requests, questions or suggestions, feel free to message me or comment here. Again, for those who are new here, I certainly hope you'll stick around! There's a lot of content pertaining to the concept, story synopsis and pitch production process to be found! And for those who have been following the blog, thank you so much for your continued support and I look forward to bringing you even more exciting updates in the near future! Cain giving a warm welcome! Isn't he a charming one? Fate Saga's main antagonist, Armand. 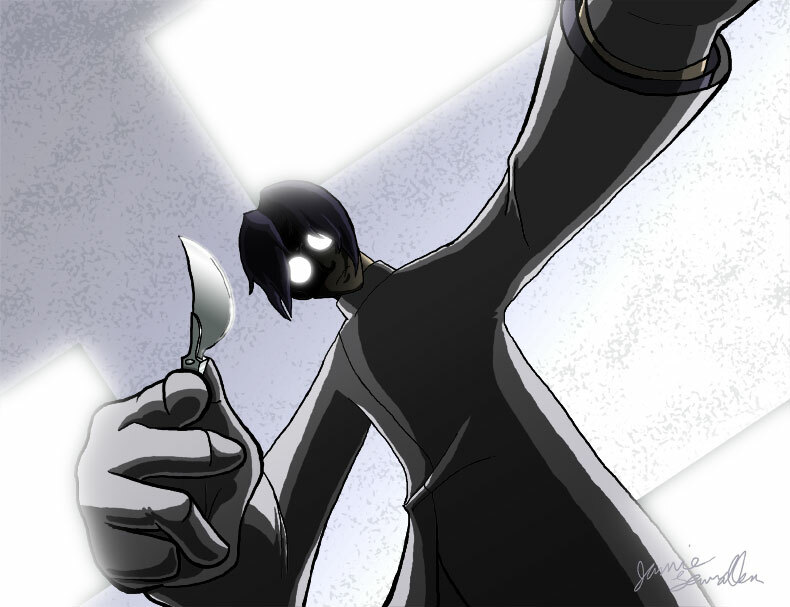 He is a scientist who has no qualms with performing cruel experiments on live and conscious patients. Armand is very intelligent, and intrigued with the power of science. He wants to know how far science can go, and to prove or disprove his hypothesis that, through scientific manipulation, if it is possible to cause a man-made apocalypse. I also really like the outfit Jess put her in. A very classy long gown that she could go to a fancy dance in. And probably swoon some of the boys there while she's at it. She did an awesome job! 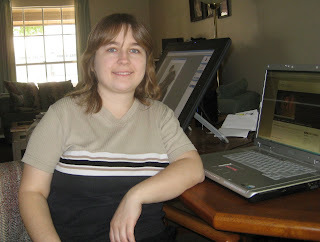 If you'd like to see some of her other amazing work, check out her blog! 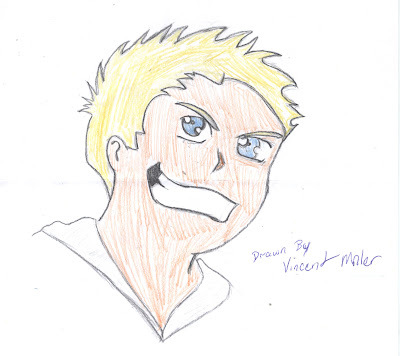 I was doing an Art Trade with Tracy MacLauchlan and Yesenia Carrero (the creators of The Taffetas) today. My request for Tracy was Rori arguing with Cain. 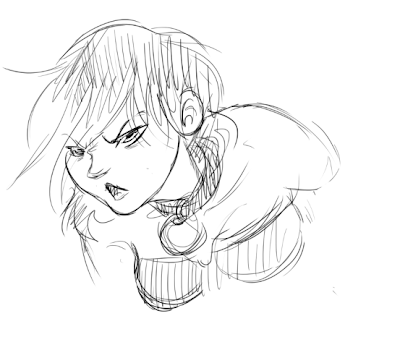 She first sent me the above image, and I thought Rori looked pretty cool and angry (and I love Tracy's feminine style!) 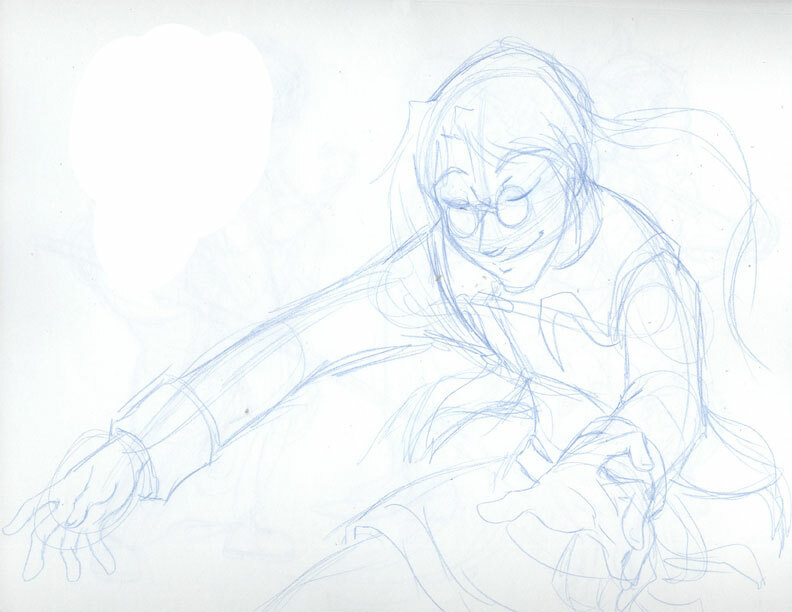 ...and then I discovered that had been her warm up sketch for the one below. Guys, I think they're going to need a mediator! I love the way Cain frames Rori (who looks like a demon about to jump him like a facehugger! ), using his body, the sword and the cape. Really cool composition! And Rori looks scary, like she's in the beginning stages of transforming into her were-form! Feel free to check out more of Tracy's beautiful artwork on her blog! This was a promotional illustration I designed originally for the Kickstarter video. The purpose was to show Vektor displaying his strength and power in a confrontation with another character (Cain was an obvious choice because he's the main character). Knowing that I wanted to move the camera vertically, I knew that the image itself needed to be vertical, so I set it to 11x17 so that it could also double as a poster. Consequently, once the Merchandise shop eventually opens, this poster will be available. 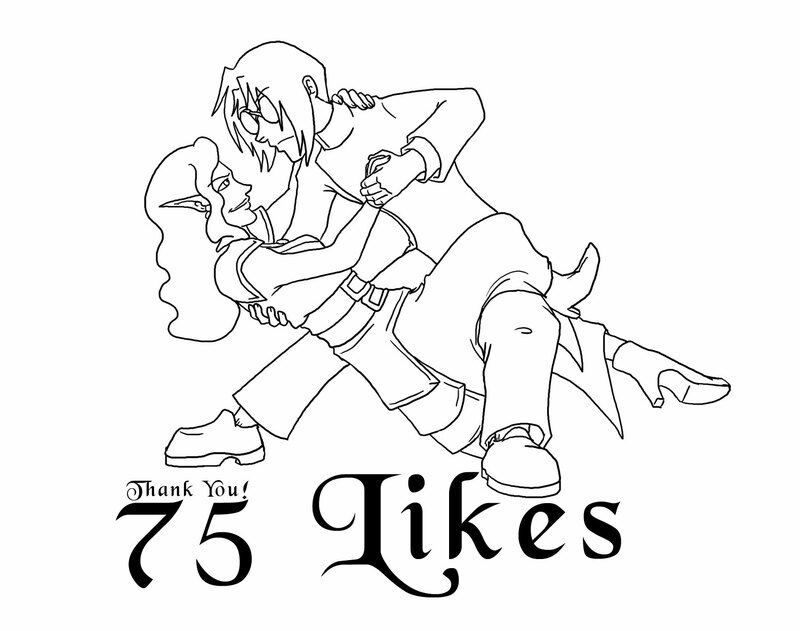 Thank You: 75 Likes on Facebook! 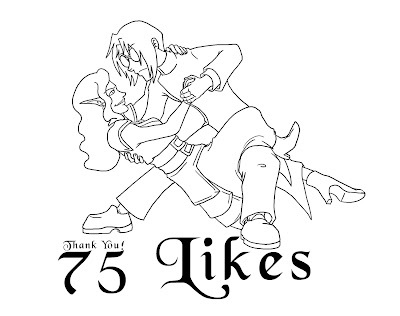 I am excited and happy to say that Fate Saga has now surpassed 75 likes on Facebook! This means that Fate Saga is growing, and more people are becoming interested! And with this weekend's San Diego Comic Con, where Animation Magazine will be distributed with our pitch and the other Pitch Party contestants inside, things can only continue to get better from here! 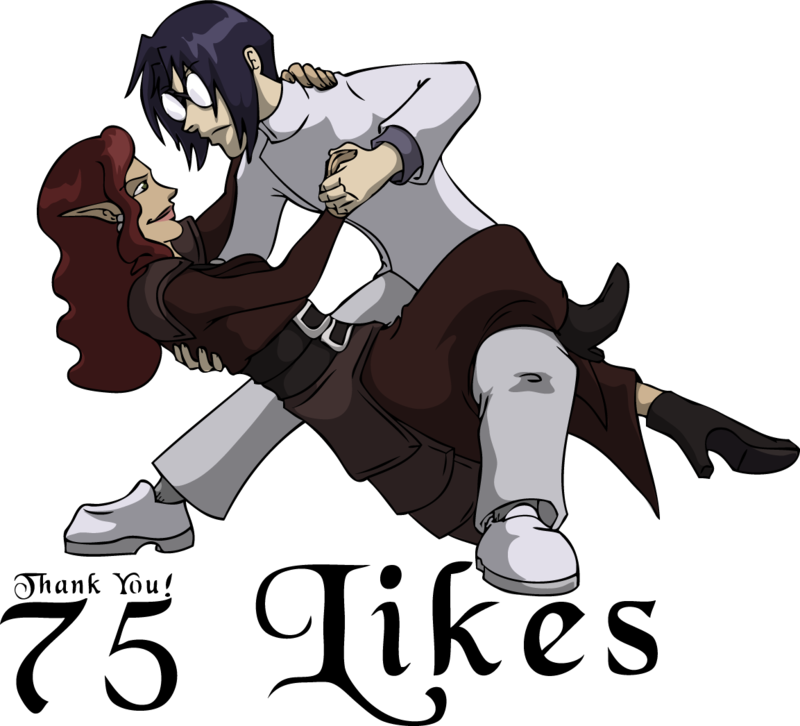 This momentous occasion is celebrated with Armand and Bianca doing the tango! Apparently Bianca had talked him into it, because she sure is enjoying it more than he is. Or maybe she's enjoying her reflection in his glasses? The world may never know. A big thank you to everyone for your help, support and interest! Lets keep the momentum going! This was Ashley's test for Bianca, done for the pilot. Bianca herself makes a very brief, non-speaking appearance in the pilot episode. However, because the pilot episode has so many bystanders who speak (or, more appropriately, think aloud), it was a good way to test for the main cast while still giving them a purpose in the pilot whether the tests were successful or not. Ashley is currently also Larkspur's voice actress, and is an absolutely perfect representation of the main hero. She also did a lovely job with Bianca! 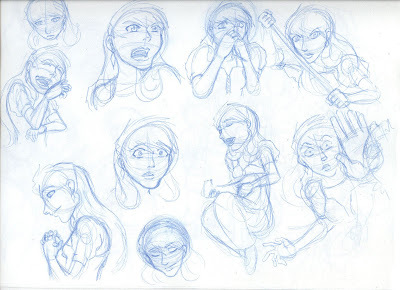 Her characterization was still in development at the time the lines were recorded, which is why this test doesn't have any of her emotional lines (angry, elated, sad, etc.) like many of the other character tests do. Eventually, I would like to try out some of her emotional lines, but for the time being, I love the sophisticated way Ashley speaks as Bianca. It makes the elf sound highly intelligent and haughty, as well as sinister. 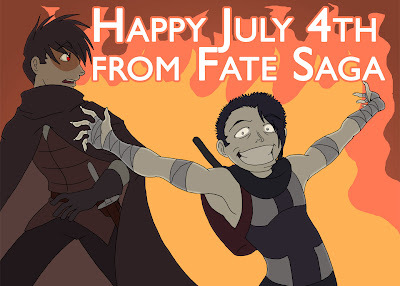 In light of discovering that Kickstarter's projects last for 60, not 90 days and that it's going to take at least 5-7 business days to verify the account, Fate Saga's launch has been delayed until August 5, 2011. This will ensure that the fundraiser will cover Anime Festival Orlando and, most importantly, Anime Weekend Atlanta - where we have a big presentation set for Friday, September 30 and Saturday, October 1. 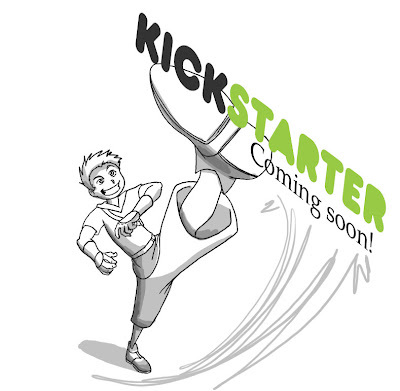 The Kickstarter project is ready, and will be launched roughly around 12pm August 5. Support Fate Saga Through Kickstarter! Fate Saga has been submitted to Kickstarter for review, and as soon as it is approved the video and content will be uploaded onto the site! I am assuming that this will be within 12-24 hours, and as soon as it's up the link will be provided here! What we're asking for is support to complete the pilot episode, to be submitted to festivals, sponsors, studios and networks in hopes of 'kickstarting' the entire series. Once it's up on Kickstarter, the blog is also going to kick into higher gear with more updates on promotions, progress on the funding, additional voice acting tests and concept art, and much more! We're hoping to make quite a buzz here for the next 90 days! Please tell your friends, family, neighbors and strangers about Fate Saga! We need your interest and support! This is the wallpaper for Vektor, Armand's alchemically enhanced henchman. Vektor is a soldier who has been brainwashed into an obedient drone, unable to think for himself in any way that requires an opinion outside of logic. Vektor is removed from his emotions and has an exceedingly high pain tolerance. He's a behemoth of a man - standing at 6'7 - with enhanced strength and stamina. Vektor fights with a multitude of long ranged weapons, including the arm-mounted auto crossbow. This is a promotional illustration of Armand, Fate Saga's main villain, to be used as part of the Kickstarter pitch video. 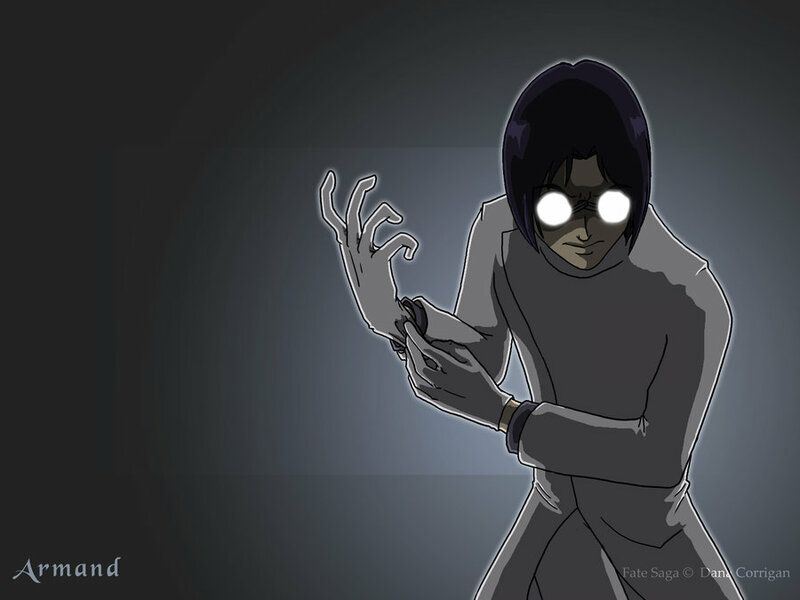 It is Armand in his laboratory, doing what he does best. Armand is meant to look creepy, mysterious and unreadable. His gloves are made from animal byproduct, as opposed to the latex, which didn't exist in medieval ages. Armand knows better to use his bare hands, even in the dark ages. I have had some requests to show the process of some of Fate Saga's work and I felt this would be a good sample to use. So for Malachi's wallpaper, I took snapshots of the progress and will explain the thought processes and techniques for each step! 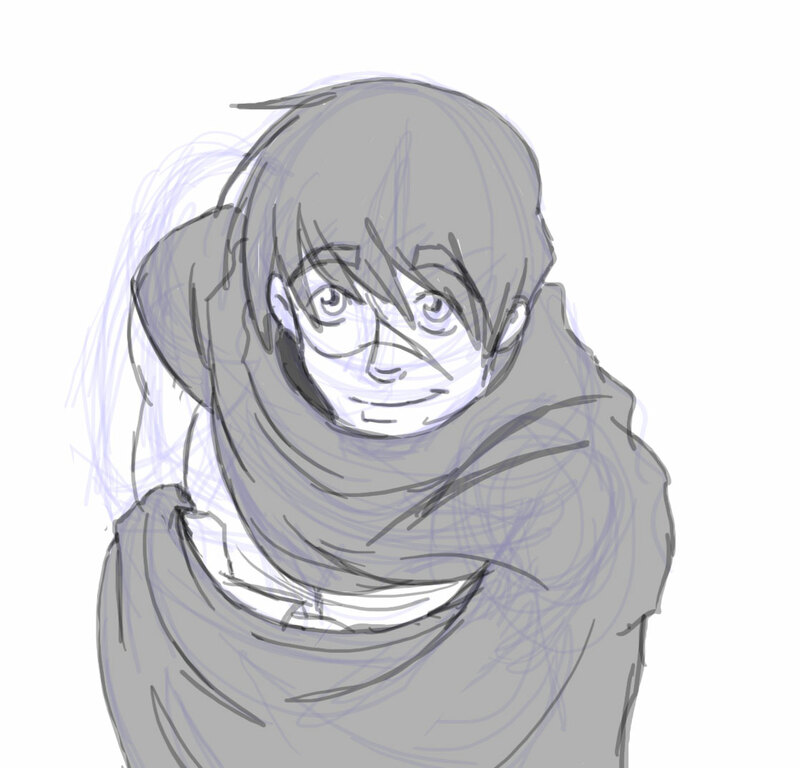 Sometimes, I do the sketches on paper first, and other times straight on the computer. For this piece, it was done on paper first. Sometimes it's based off of the idea and whether I feel I need a lot of references, or whether I'm physically near a computer at the time. 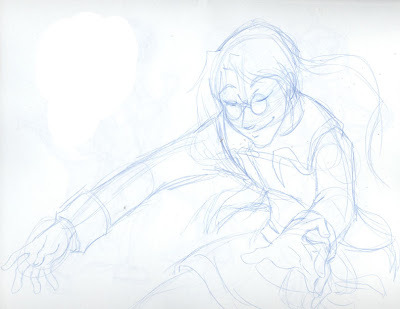 In this particular instance, I was on an airplane so the drawing utensil at my disposal was my sketchbook and blue sketching pencil. 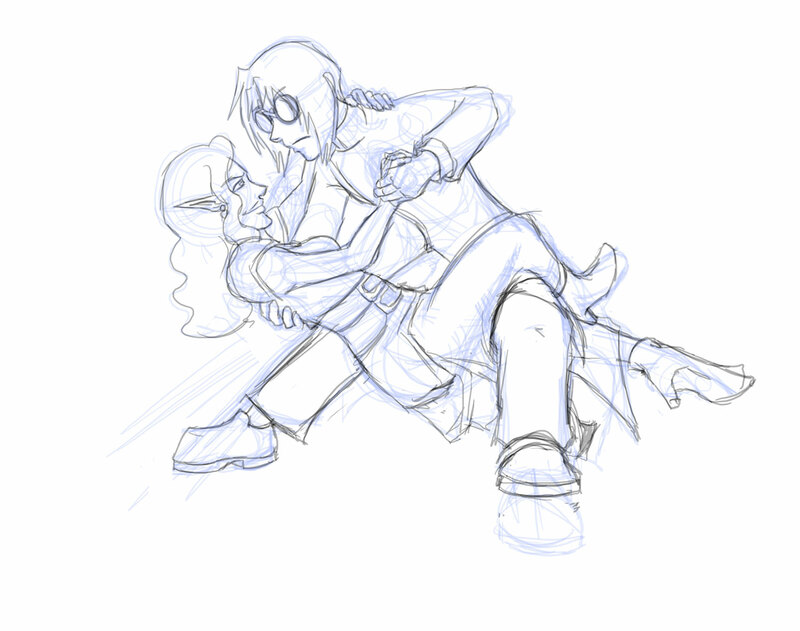 The main idea I wanted to get with this drawing was serenity and grace, both of which Malachi is meant to represent. He is a man who has lived through the trials and tribulations of his powers and has learned to control them. In this stage, I fixed some problems with the sketch (such as the size of Malachi's head and nose) and cleaned up the details. The inking was done in Photoshop, using the brush tool. The original sketch was at a low opacity underneath. 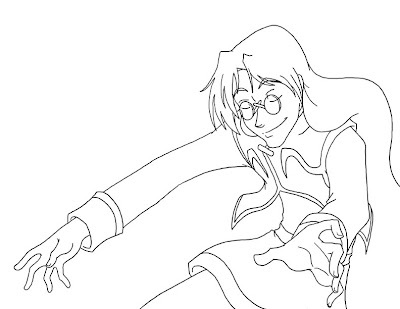 Some of the inking was a retracing of the sketch, and the parts that were fixed were redrawn. 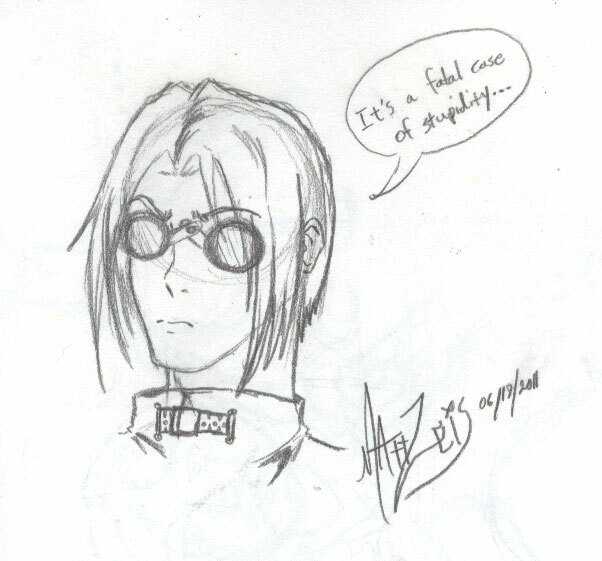 Because the problems in the sketch weren't serious, it didn't require me to re-construct anything. 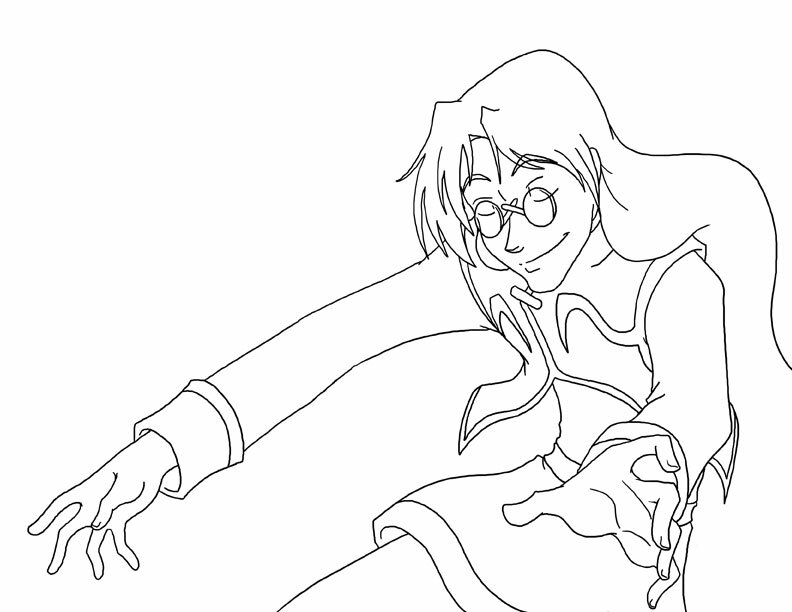 Also, right before coloring I decided to move Malachi towards the right side of the screen, to both give more room on the left and cut off some of his flowing hair. 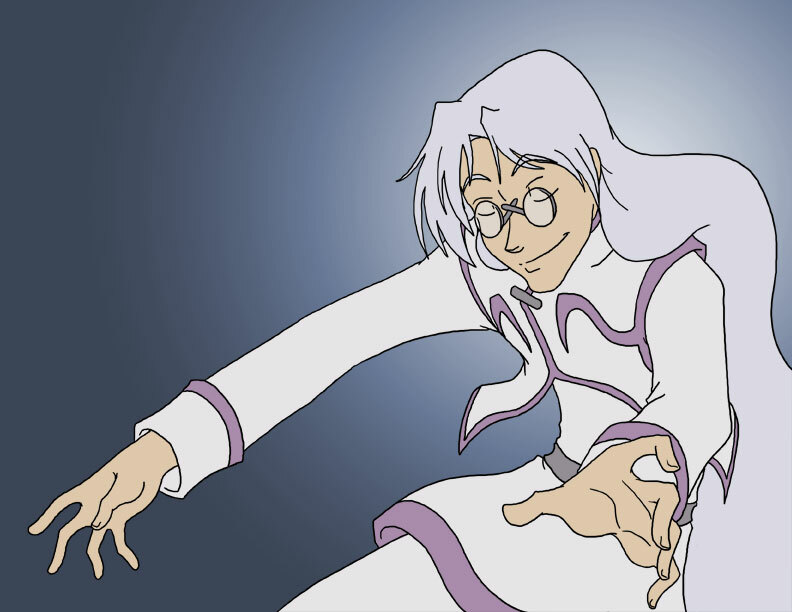 For this stage, I added a gradient behind Malachi to give myself an idea of what colors were going to be used, and because Malachi's color scheme is predominantly white, having a darker color behind him makes it easier to endure that I don't accidentally leave any gaps in the flat colors. With a background that is a much different color than the character's color, any gaps would stand out and should be more visible. I used his bio picture as a reference for Malachi's colors, and added his flat colors before any painting or shading because, regardless of any effects I may place on him afterwards, I always keep the character's base colors the same for consistency. I duplicated the gradient layer and heightened the contrast, and set the top gradient layer to Screen, lowered the opacity to 60% (because it was too strong), and added a gradient layer mask in order to emphasize the brightness around Malachi himself while keeping the edges of the screen dark. This was both to give Malachi a sort of holy or epic appearance, while drawing the eye directly to his face. The shadows were done with a single additional Multiply layer, with a light grey color - as this was a piece where I didn't want the shadows to be too dramatic. The lighting is coming from behind him, giving him a rim light. 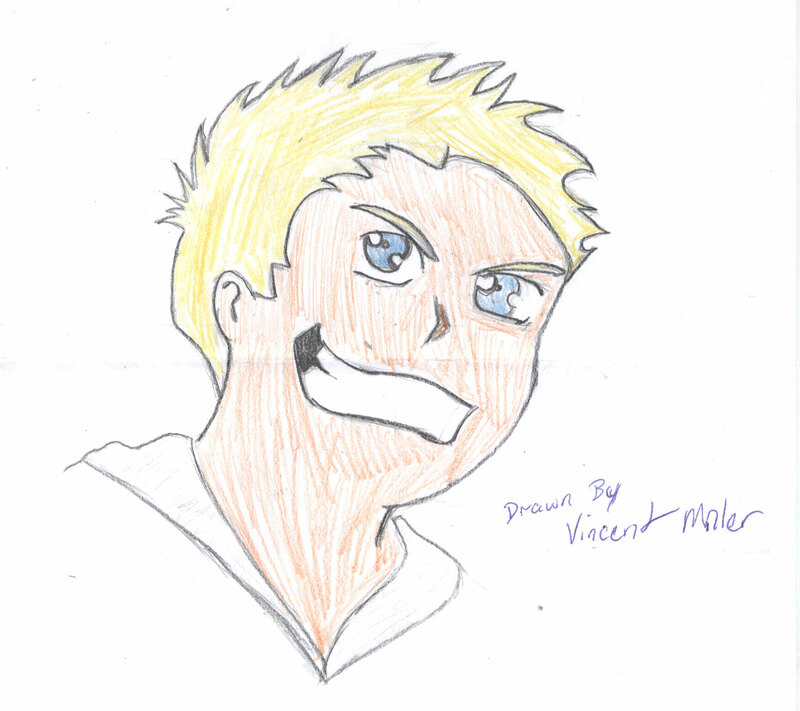 Here is where I added special effects to the background. I added some very faint smoke effects (both light and dark) to add even more contrast. I then added a series of dots and lines with the white brush tool at a low opacity, and used the gausian and motion blur to give the feel of magic. 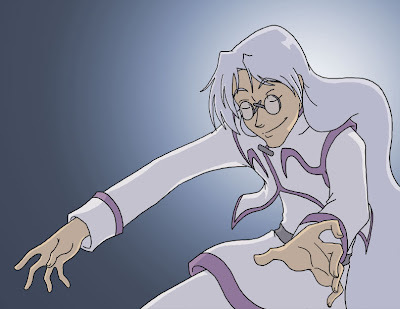 Malachi is a gentleman who is slightly flamboyant and uses magic as opposed to brute strength. I wanted to convey that visually through the background. Finally, as with the other characters, Malachi's name and the copyright disclaimer was listed on the bottom of the image. Anyone is free to use this as their wallpaper, but otherwise Malachi and Fate Saga itself is protected under copyright law. One week from today, Fate Saga will launch on Kickstarter to start the 90 day fundraiser. The way Kickstarter works is by allowing people to 'pledge' to donate to an artistic project. When the project is launched, it will include the amount of money needed to complete the film. Then, there will be a 90 day period where viewers can "pledge" a donation - which means they offer to donate - in return for rewards. The rewards Fate Saga will be offering are listed in the Pitch section. Once the 90 day period is finished, if enough money has been raised, the pledges are deducted from the donators' accounts. If the project is even $1 under, then the fundraiser is canceled and all money is returned to the donators. This is to ensure that no donations would go to waste. It's literally all or nothing. However, if the amount asked for is met any time before the 90 days is over, the fundraiser will still continue until the 90 days is over. The time between now and then will be to tweak the video and finish up additional graphics for the big day. This upcoming 90 day period will be a crucial time. If we can get the funding for the pilot episode, we'll not only be able to put a deadline on it, but also be able to afford the production quality that will give a great preview for what the series will look like in its entirety once it's picked up. Once the pilot is complete, it will be sent along with the pitch package to companies, as well as submitted to animation and film festivals. Ultimately, we're hoping to use the pilot as a means to gain attention and sponsorship to launch the production of the entire series. This is a wallpaper featuring the squire-turned-thief (and jokester), Guile Thantos. 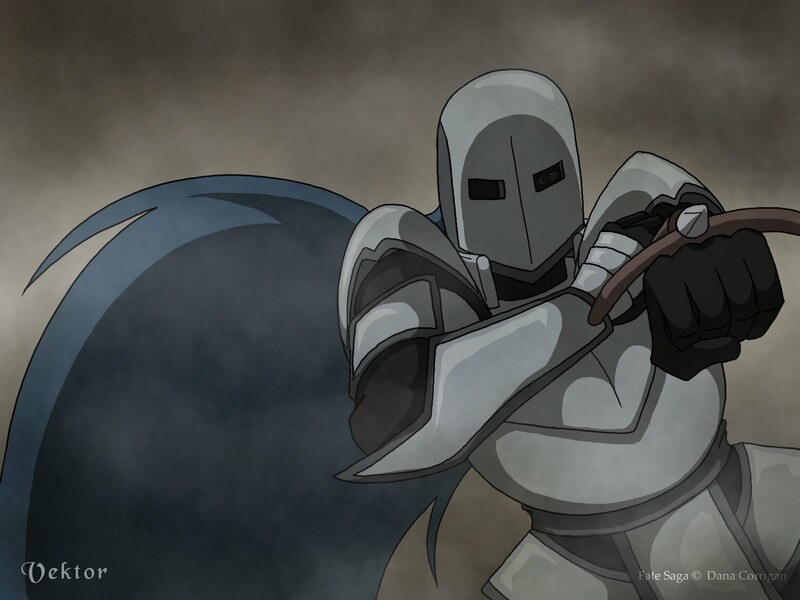 Guile is a 15 year old boy who was born into a family of knights, much like Cain. However, due to Guile's incompetence as a squire's staining the family name, Guile was kicked out of the knighthood and has hence entered a life of a thief - or so he says. Guile is a jovial young man who always thinks in the present. He cracks jokes and is always smiling. However, his irresponsibility and loose morals conflict with Cain, who has a more black and white/good and evil view of the world. Shot 065-067 continuity version 2. UPDATE: Started shot 67 at point of impact instead of showing Cyrus coming in from the right, to see if that helps more with the flow continuity and keeping the viewer's eye at the center. Does this help? This is just a test to see if Shot 67's profile view flows well with the previous two shots. Since shot 65 and 66 are both from a front view with Cyrus jumping into the camera, and the camera zooming into Cain's face (meant to imply Cyrus' point of view), I think shot 67 flows well and shows nice impact. But before we start cleaning it up, I wanted to post it up here for any opinions. This is a wallpaper from one of the more minor (but still important) characters, Malachi Maelstromm. Malachi is a professor from the Duerian School of Gifted Youths, where he trains children with special abilities on how to use their powers. He moved to Duero shortly after it was constructed, and helped to found the school. Malachi is a gentle, soft-spoken man who often takes a fatherly role not only to the children of the school, but also other forlorn characters or those who are struggling with their powers. Often, Larkspur goes to him for advice and Cain also seeks his wisdom at some point. Like Cain, Malachi is also psychic. However, his powers pertain to telepathy and telekinesis. Malachi's control over his ability leads to others considering him to be one of the most powerful psychic in the world. The results for the Pitch Party Contest are in! Congratulations to the winners and honorable mentions! Although Fate Saga didn't win, it was still a great experience and an amazing opportunity. The Fate Saga pitch will still be featured in the Animation Magazine's July issue, and will still be distributed all over the San Diego Comic Con. That is great exposure and will hopefully introduce more people to Fate Saga. With that in mind, all of the entries win. Thank you everyone for your support! For everyone brought to this blog from the Animation Magazine's pitch contest, I want to extend a great welcome and I hope you will stay along for the ride! This is a wallpaper for the villainess of Fate Saga, Bianca. She is a newer recruit of Armand's and an alchemist-in-training. What drew Bianca to the villains was the seduction of power that their science and knowledge provide. What draws Armand into accepting her is her intellect and magical power. 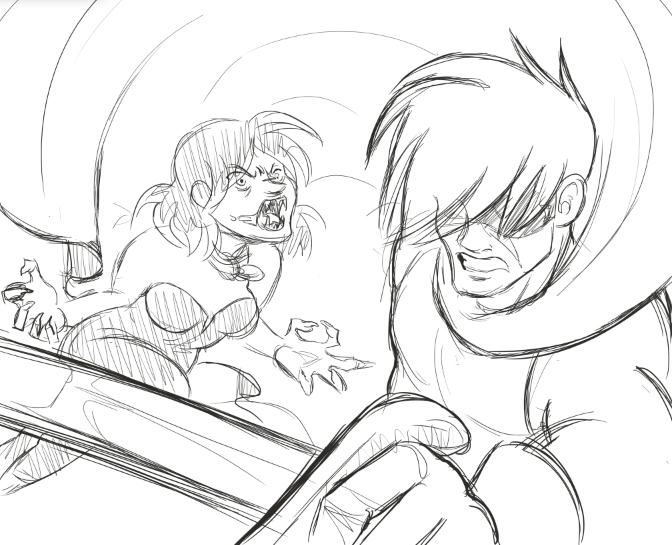 Bianca is a force to be reckoned with, and quite possibly the most powerful nemesis of Fate Saga. 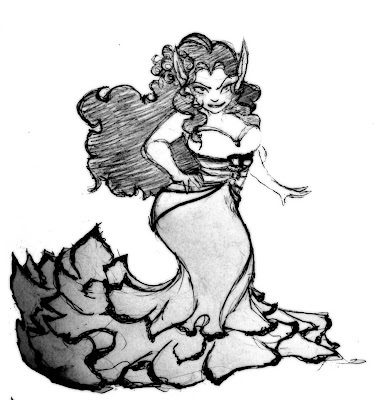 Bianca is an elemental elven sorceress, who is feared and ostracized by her shamanistic people for her destructive use of their gift. She is the type of woman who doesn't care whether something is considered right or wrong - she invests her time and energy into anything she deems worth her interest. This not only extends to magic, but also in every other area of her life. Happy July 4th from Fate Saga! Cyrus may not know anything about America's declaration of independence on July 4, 1776. However, what he does know - about July 4th being a day of firework and other flashy demonstrations of celebration - is all he needs to consider this holiday one of his favorites. Cain is shocked to see that yet another one of his visions is coming to pass - Who could have done this?!! Certainly not Cyrus, who is frolicking away! In Metrocon 2011, I met a gentleman named Scott Smith who was interested in trying out for Fate Saga's Cyrus. On Sunday, after the convention was over, we did a test recording for Cyrus and, at the conclusion of that, I also asked if he could try for Malachi as well because I felt he might be a good match. Scott did a fantastic job as both Cyrus and Malachi. He has a great range not only to the tone of his voice (being capable of raising it to a falsetto, as well as dropping it to almost a baritone), but also in how he displays emotions through his voice. He did a great job with both Malachi and Cyrus, and managed to make them both sound completely different from each other. This is his test for Malachi. Cyrus' will be uploaded in the near future as well. Hello! It's been a busy last few weeks, between graduation, Metrocon and promoting Fate Saga for the Animation Magazine's Pitch Party online voting. But now that it's over, I have some time to talk about what's happened at the events, and some upcoming updates to be expected from Fate Saga! The convention went very well! It was my first time conducting panels at a convention, and I did five hours worth of them over a span of three days. These panels were more instructional, using Fate Saga as my example and point of reference. Part of the concept behind the panels was to promote Fate Saga, of course. But it was also used as a way to give con-goers who might be considering pursuing animation as a career (or those who just might be curious about how the whole process works. It's far more involved than what most people think) a place to find out more insider information, from the point of view of someone who's also still learning and experimenting. As one of my professors from Savannah College of Art and Design, Dr. daCosta, used to say (I may be butchering his quote here, but it was something like this), "students can sometimes learn more from each other than from professors or superiors, because they're talking and learning at the same level, instead of being talked down to or having to look up to the professor." The panels at Metrocon also worked well as a preview or practice for AWA. It was an especially good learning experience because we ran into a lot of technical issues at Metrocon, that I am going to work to avoid for AWA. I haven't had a Mac computer for long, yet, and sometimes forget that they don't like to play well with other equipment. We were able to make due without the projector at Metrocon and still have a successful presentation, but that's not going to work for Anime Weekend Atlanta. Still, we have until the end of September to make sure everything is right. On a great note, I've had the pleasure of meeting with some really awesome people at Metrocon! 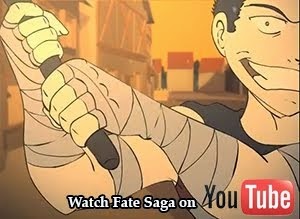 Some are interested in helping with Fate Saga - including environmental artists and voice actors, and others are interested in simply keeping up with/watching it (which is also amazing! What good is a series without fans?)! I even received two very awesome fan artworks during the convention featured in this post, from the talented Matthew Zeis and Vincent Maler! 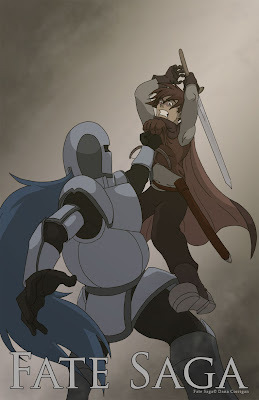 As you may know from the prior posts, Fate Saga was successfully submitted to Animation Magazine's Pitch Party, sponsored by Savannah College of Art and Design. The online voting was this past week. I want to give another big thanks to everyone who took the time to vote and promoted the series to their friends and families! I really appreciate it! Every vote counted! Overall, I have no idea how well Fate Saga fared in comparison to its competition and I won't know until the results are released around the second week of July. There were some other great pitches on there, including my good friend's projects, Taffetas and Duck and Monster. I wish them the best! Although it would be great if Fate Saga won the voting, even if it doesn't win that doesn't mean it's the end! There are actually three categories from which a pitch can win. Along with the online voting, there is also the Judge's Pick and Staff's Choice. Best case scenario, Fate Saga might have the opportunity to be pitched to the judge of my choice. Good case scenario, Fate Saga may have an additional article in the August edition of Animation Magazine. But even worst case scenario, Fate Saga along with the other projects will all get exposure on the July issue, and at the very least viewed by the judges and staff. It may lead into opportunities and recognition that Fate Saga wouldn't have otherwise had, and that definitely counts for something! I'll keep you informed! Now that summer has begun and, for some, class work has eased up or ended, production is going to kick back up at a slow but steady pace, so expect to see some updates to the pilot soon! Also, on July 20th, Fate Saga is going to be put up on Kickstarter.com for funding and will be up for 90 days. If it's successful, then the pilot's production will kick up to full speed and we can put a due date on this project! We have some new Fate Saga recruits who are in the process of being added to the Crew List! Along with updates to the Crew, expect to see some great work coming up, including voice acting tests and environmental art! Isn't he adorable?! 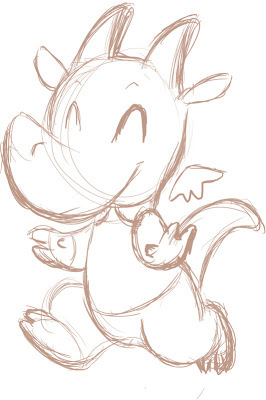 Seiron looks like a baby pokemon, or that adorable little mascot that you often see in anime or cartoon shows. I like how his little wings aren't actually attached to his body. You know he somehow still flies with them.